NEW BRUNSWICK, N.J.--(BUSINESS WIRE)--Spectrum Chemical Mfg. 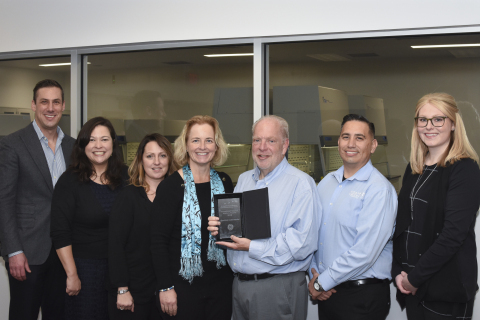 Corp., a leading global manufacturer and distributor of fine chemicals, laboratory equipment and supplies, has been honored for the second year in a row with the Distinguished Partner Award for Applied Markets from GE Healthcare Life Sciences. GE Healthcare Life Sciences, a division of GE Healthcare, presented Spectrum Chemical with the award at Spectrum’s National Sales Meeting held in New Brunswick, NJ. Spectrum Chemical is a major supplier of GE Healthcare Life Sciences, including products such as syringe filters, syringeless filters, capsule filters, and membranes, serving customers in the HPLC, Sample Preparation and Environmental markets. GE Healthcare Life Sciences, a division of GE Healthcare, provides expertise and tools for a wide range of applications, including basic research of cells and proteins, drug discovery research, as well as tools to support large-scale manufacturing of biopharmaceuticals. About Spectrum Chemical Mfg. Corp. Spectrum Chemical Mfg. Corp. is a leading global manufacturer and distributor of fine chemicals, laboratory equipment and supplies for a range of industries. Spectrum offers the largest selection of USP chemicals in the world, including laboratory, scale up and bulk quantities. Bicoastal cGMP facilities are FDA registered and inspected, with additional certification to the ISO 9001:2015 standard. Spectrum performs extensive laboratory testing using the most modern instrumentation to ensure the highest quality standards in both its New Jersey and California laboratories. The company’s extensive scientific documentation provides the change control needed for quality-driven industries. For more information, visit SpectrumChemical.com. Leading global manufacturer and distributor Spectrum Chemical named GE Healthcare Distinguished Partner in Applied Markets for two years in a row.